Video abstract presented by Rohit Om Parkash. Purpose: To describe a trypan blue dye staining technique under air, a modification of the previously described 30 G needle under-air technique. Design: This is a prospective, randomized study of 1,000 eyes of 952 patients undergoing phacoemulsification in a private practice setting from January 2015 to August 2016. Three variants as a modification of the previously known 30 G needle technique are described. In our technique, after injecting one drop of the dye under air, the needle is kept in the anterior chamber (AC) for 15 seconds. In the second variation, along with the additional hold time, 0.05 mL air is injected prior to dye injection to deepen the AC in eyes with shallow ACs or in cases with increased posterior pressure. The third variation is the selective painting approach in which more than one drop is injected for a homogenous staining. Main outcome measures: The main outcome measures were safety and reproducibility of the technique along with homogeneity and uniformity of the anterior capsule staining. Results: AC remained stable during the hold time of 15 seconds with no egress of air. No iatrogenic trauma occurred in any of the cases. All cases had a homogeneously stained anterior capsule. The staining intensity was excellent in 80.8% of the eyes and good in 19.2% of the eyes. Conclusion: This is a safe, simple, and cost-effective technique which achieves consistent, uniform, and reproducible staining. It overcomes the shortcomings of the known 30 G needle technique. Visualization of the anterior capsule is compromised when the red reflex is absent or insufficient. In such situations, there is a strong predisposition for anterior capsular tear extending to the periphery, with subsequent predisposition to posterior capsule rupture, vitreous loss, and posterior dislocation of nucleus.1,2 Trypan blue (TB) dye staining of anterior capsule, as initiated by Melles et al3 in 1999, helps in completing capsulorhexis in these challenging situations. A small amount of TB dye provides good anterior capsule staining. Endothelium toxicity is negligible with TB dye as it is used in low concentration. TB dye has been employed in various techniques to stain anterior capsule alone or in association with air or ophthalmic viscosurgical devices (OVD).3–7 The wide array of techniques have their own set of limitations. Ideal TB dye staining technique should be easy and safe, cost-effective, and provide reproducible and homogenous staining. We describe a technique of TB dye staining which fulfills all the prerequisites for ideal staining of anterior capsule. Our modified 30 G needle technique under air includes safe introduction of needle into the anterior chamber (AC), staining with a single drop of TB, selective painting, if required, of the anterior capsule with TB dye, and adequate hold time. The selective painting of the anterior capsule with stable dye lake during the hold time aids in replicating uniform and consistent staining of anterior capsule. This prospective, nonrandomized clinical study comprised 1,000 eyes of 952 patients with a clinical diagnosis of cataract who underwent phacoemulsification in a private practice setting during the period of January 2015 till August 2016. All surgeries were performed by a single surgeon. The protocol adhered to the tenets of the Declaration of Helsinki, and approval was taken from the Dr Om Parkash Eye Institute hospital ethics committee. Informed consent was obtained from all participants for the surgical procedure as well as for enrollment in the study. Patients enrolled were 45–75 years of age (mean 64.2±8.4 years), presenting with cataract masking red reflex, such as mature cataract, dense cortical cataract, dense posterior sub capsular cataract, and eyes with dense asteroid hyalosis. The other inclusion criteria were clear cornea, endothelial cell count of more than 2,200 cells/mm2, and pupillary diameter of 7 mm or more. Patients with ocular comorbidities such as corneal opacity, small pupil, subluxated cataract, and perforating trauma were excluded from the study. The study used strict selection criteria so as to limit variables that could affect the staining consistency. Patients underwent eye examination including objective and manifest visual acuity, intraocular pressure, keratometric measurements, slit-lamp examination, and B scan ultrasonography. Immersion scan/optical biometry was done for the axial length measurement, anterior chamber depth (ACD) measurement, and intraocular lens power calculation. All cases underwent routine systemic evaluation. Eyes were anesthetized preoperatively with proparacaine hydrochloride 0.5% (Paracain eye drops, Sunways pharmaceuticals Pvt Ltd, New Delhi, India) instilled 2–3 times under aseptic conditions. In 86 patients, who were uncooperative, peri-bulbar block was given. A 2.8 mm/2.2 mm temporal, clear corneal incision was made with a keratome blade (Ophthalmic Marketing and Services Pvt. Ltd, Ahmedabad, Gujarat, India). A side port paracentesis was made with a 15° blade (Ophthalmic Marketing and Services Pvt. Ltd) 2 o’clock from the main tunnel. AC was inflated with air using a cannula over 2.5 mL syringe. Keeping the cannula tip at the distal end of the tunnel, a single large air bubble was injected. A 30 G needle was mounted on a 1.0 mL syringe containing 0.08% TB dye (Rhex ID, Appasamy ocular Devices Pvt. Ltd, Solan, Himachal Pradesh, India). Anterior capsule was entered with the 30 G needle keeping the bevel down. In our technique, as opposed to the original 30 G needle technique, the needle bevel is kept downward and not rotated. In cases with convex anterior capsule and ACD depth ≤3.00 mm, the proximal half of the syringe was filled with ~0.05 mL of air. The air injection prior to the injection of the dye ensured deepening of shallow AC and elimination of the risk of iatrogenic trauma to anterior capsule by the 30 G needle. One drop of TB dye was injected and adequate staining of anterior capsule was observed. In cases with inadequate staining, additional drops of TB dye were used to selectively paint the areas of inadequate staining. The 30 G needle was kept in the anterior capsule for 15 seconds. The hold time of the needle helps in uniform, consistent, and reproducible staining by providing adequate and sustained contact time with the anterior capsule. Air was substituted with the OVD through the main tunnel. A uniform staining pattern was appreciated, and the capsulorhexis was completed with a capsulorhexis forceps or a cystitome. Masking of red reflex was monitored in all the cases. Phacoemulsification was attempted in all the cases. Postoperatively, the follow-up visits were planned on days 1, 3, 14, and 40. Postoperative treatment for all patients included topical antibiotics, topical steroid with tapering dose, and cycloplegics. The visual acuity, intraocular pressure, and slit-lamp biomicroscopy were performed at follow-up visits. The endothelial cell counts were evaluated on day 40. We describe three variants of our technique of TB dye staining. During the procedure, no shallowing of AC was noted while entering with the 30 G needle in all the cases. No iatrogenic trauma occurred in any of the cases while entering with the 30 G needle. AC remained stable during the hold time of 15 seconds, and no egress of air was observed. In 98.6% of cases, capsulorhexis was completed successfully. In 33 out of 1,000 cases (3.3%), capsulorhexis extension occurred radially. In our study, 162 eyes (16.2%) required additional drops of TB dye. There was masking of red reflex in 134 eyes (13.4%). The posterior capsular spilling was attributed to rhexis extension and zonulopathy. In 7 eyes (0.7%), no obvious cause of spilling into posterior capsule could be ascertained. The causes and incidence of spilling of dye into the posterior segment were similar in all the three variant groups. Additional drops of TB dye usage for selective painting did not lead to spilling into the posterior segment. 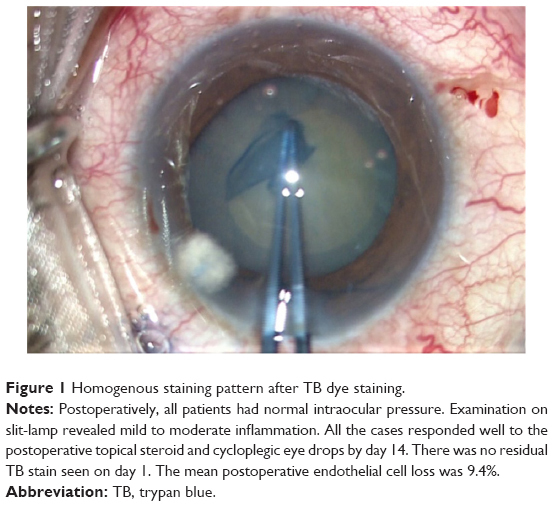 However, the intensity of spilling of dye into the posterior segment, in cases with anterior capsular tears and zonulopathy, was more profound in the variant group 3 because of increased amount of TB dye usage (Table 1). All cases had a homogeneously stained anterior capsule during the entire surgical procedure (Figure 1). The staining intensity was excellent in 80.8% of the eyes and good in 19.2% of the eyes (Table 2). During phacoemulsification, three patients with anterior capsular tears had a posterior capsule rupture. One of the patients with posterior capsule rupture had a nucleus drop. Phacoemulsification could be successfully completed in the rest of the cases. Figure 1 Homogenous staining pattern after TB dye staining. Notes: Postoperatively, all patients had normal intraocular pressure. Examination on slit-lamp revealed mild to moderate inflammation. All the cases responded well to the postoperative topical steroid and cycloplegic eye drops by day 14. There was no residual TB stain seen on day 1. The mean postoperative endothelial cell loss was 9.4%. TB dye is used for staining the anterior capsule as a standalone technique or in conjunction with air or viscoelastic agents.3–7 The spectrum of techniques described in the literature for anterior capsular staining are far from ideal. The aim is to have a simple, safe, and cost-effective staining technique which consistently achieves a uniform and reproducible anterior capsular staining. Laureano and Coroneo4 and Mearza and Kulkarni5 described a one-step method for TB staining of the anterior capsule. The aqueous humor is drained through the paracentesis port and TB is injected and allowed to remain in the AC for 30–60 seconds. This technique is simple and cost-effective. However, TB injection is associated with pockets of dye overpooling with a resultant obscured view.13 Staining, if inadequate or inconsistent, can require restaining. This increases the possibility of toxicity. There is a high probability of the dye spilling into the vitreous cavity and masking the red reflex, causing difficulty in performing phacoemulsification. The dye is in direct contact with endothelium, which can sometimes be detrimental. Moreover, the unstable AC and poor visibility makes dye replacement with viscoelastic prone to anterior capsular injury. In the 30 G needle technique described by Giammaria et al,20 TB dye is injected using a 30 G needle under air for staining. This reduces the shortcomings associated with the under-air or OVD-supplemented techniques. A separate needle entry through the peripheral cornea provides stable AC by preventing the air from egressing out. The use of sharp needle decreases adhesive forces with the air meniscus, thus allowing effortless spreading of the dye. There is no need for mechanical spreading of the dye. There is a stable dye lake as compared to the under-air technique using a cannula through the paracentesis. This technique is cost-effective and less time-consuming. As the AC is maintained throughout the staining procedure, there is no/minimal contact with the corneal endothelium. However, introduction of the sharp needle can cause iatrogenic trauma, especially in cases in which AC is shallow or there is high posterior pressure. The stable settings provide adequate staining of the anterior capsule. The staining can still be inadequate because the exit of the needle through the site of entry causes leakage of some dye or air. We describe for the first time an under-air technique for TB staining of anterior capsule which maintains the advantages and eliminates the shortcomings of all the previously described staining techniques. The ideal TB staining should be safe and simple with minimal cost bearing and characterized by reproducible and homogenous staining pattern. Our technique retains the cost-effective advantage which under-air and direct dye staining techniques have over the OVD-assisted techniques. This technique matches the OVD-assisted techniques in providing the perfect environment for TB staining by offering stable AC during the TB contact with the anterior capsule. With this technique, the dye lake is more stable than all the previously described under-air staining techniques. This advantage is primarily due to a steady AC attained by holding the needle in the AC for 15 seconds. The minimum exposure time required to attain an effective staining ranges from 5 seconds to 2 minutes.21,22 The sustained contact of TB with the anterior capsule in our technique for 15 seconds facilitates better staining. In this technique, there is no endothelial toxicity because of minimal contact with corneal endothelium. The technique has the added advantage of providing simple and risk-free staining. In our modification of the technique, the use of a smaller diameter, 1 mL, syringe facilitates easier and safer manipulation of the needle inside the AC. In cases with shallow AC like intumescent cataracts and increased posterior pressure, we modify the technique by filling the proximal 0.05 mL of the syringe with air instead of TB. The air injection, prior to TB injection, flattens the iris lens diaphragm and prevents trauma by the sharp needle. Hence, the sufficiently deep AC in all cases allows trauma-free introduction of the sharp 30 G needle with its bevel down, thereby negating the need of risky manipulation of rotating the needle in AC. The acquired simplicity and safety profile in our technique has an advantage over the difficult USST and the risky, direct TB staining techniques. The technique provides better anterior capsular visualization than the OVD-assisted techniques because of the absence of dye pooling during the staining process. There is instant visualization of differential staining pattern. The surgeon can selectively paint the anterior capsule with one or two drops of TB dye on the unstained anterior capsular areas. The ease of carrying out the staining in all challenging surgical scenarios. The execution of direct application of dye on target tissue. Sustained stable AC due to the needle hold time. Excellent visualization of anterior capsule all the time because of absence of dye pooling. The option of selective painting of anterior capsule when confronted with improper staining. This technique has the advantage of no toxicity and no spillage of dye into the posterior segment because of minimal usage of TB dye. The spilling of dye into the posterior capsule observed in our cases was in eyes with Argentinean sign and weak zonules as in pseudoexfoliation syndrome, history of trauma, and previous ocular surgery. There were 7 eyes wherein the cause could not be ascertained. There was no spilling of dye associated with additional TB drops usage because there was no spreading of dye with high pressure and the injection of dye was done in a controlled way inside the air bubble using a 1.0 mL syringe. In conclusion, we have tried to evolve a technique of TB staining of anterior capsule which combines the advantages of the previous techniques and overcomes the drawbacks of these techniques (Table 3). Abbreviations: AC, anterior chamber; TB, trypan blue. This study was presented at the European Society for Cataract and Refractive Surgeons 2015: Comparative study of two techniques of staining anterior capsule with TB dye using 30 G needle and 26 G cannula. None of the authors have any financial support or relationships that may pose conflict of interest. The authors report no other conflicts of interest in this work. Gimbal HV, Neumann T. Development, advantages, and methods of the continuous circular capsulorhexis technique. J Cataract Refract Surg. 1990;16:31–37. Assia EI, Apple DJ, Barden A, Tsai JC, Castaneda VE, Hoggatt JS. An experimental study comparing various anterior capsulectomy techniques. Arch Ophthalmol. 1991;109:642–647. Melles GR, de Waard PW, Pameyer JH, Beekhuis W. Trypan blue capsule staining to visualize the capsulorhexis in cataract surgery. J Cataract Refract Surg. 1999;25:7–9. Laureano JS, Coroneo MT. Crystalline lens capsule staining with trypan blue. J Cataract Refract Surg. 2004;30:2046–2049. Mearza AA, Kulkarni AA. Capsule staining techniques. J Cataract Refract Surg. 2004;30:2462. Arshinoff SA. Using BSS with viscoadaptives in the ultimate soft-shell technique. J Cataract Refract Surg. 2002;28:1509–1514. Marques DM, Marques FF, Osher RH. Three-step technique for staining the anterior lens capsule with indocyanine green or trypan blue. J Cataract Refract Surg. 2004;30:13–16. Gimbel H, Neuhann T. Continuous curvilinear capsulorhexis. J Cataract Refract Surg. 1991;17(1):110–111. Pandey SK, Werner L, Vroman DT, Apple DJ. Dye-enhanced anterior capsulorhexis: surgical techniques, guidelines, and recommendations for surgeons. Comp Ophthalmol Update. 2003;4:179–185. Fritz W. Fluorescein blue light-assisted capsulorhexis for mature or hypermature cataract. J Cataract Refract Surg. 1998;24:19–20. Horiguchi M, Miyake K, Ohta I, Ito Y. Staining of the lens capsule for circular continuous capsulorhexis in eyes with white cataract. Arch Ophthalmol. 1998;116:535–537. Pandey SK, Werner L, Escobar-Gomez M, Roig-Melo EA, Apple DJ. Dye-enhanced cataract surgery. Part 1: Anterior capsule staining for capsulorhexis in advanced/white cataract. J Cataract Refract Surg. 2000;26:1052–1059. Marques F, Marques DMV. Capsule staining techniques [letter]. J Cataract Refract Surg. 2004;30:2462. Khokhar S, Pangtey MS, Panda A, Selthi HS. Painting technique for staining the anterior lens capsule. J Cataract Refract Surg. 2003;29:435–436. Kayikiçioğlu Ö, Erakgün T, Güler C. Trypan blue mixed with sodium hyaluronate for capsulorhexis [letter]. J Cataract Refract Surg. 2001;27:970. Dada VK, Sudan R, Sharma N, Dada T. Trypan blue with a viscoelastic agent [letter]. J Cataract Refract Surg. 2002;28:205–206. Lanzl IM, Mertz MM. Why mix trypan blue with viscoelastic agents? [letter]. J Cataract Refract Surg. 2003;29:237. Arshinoff S. Five strategies to best use the Ultimate Soft Shell Technique. Eyeworld. 2004;30(8):72. Chowdhury PK, Raj SM, Vasavada AR. Inadvertent staining of the vitreous with trypan blue. J Cataract Refract Surg. 2004;30(1):274–276. Giammaria D, Giannotti M, Scopelliti A, Pellegrini G, Giannotti B. Under-air staining of the anterior capsule using Trypan blue with a 30 G needle. Clin Ophthalmol. 2013;7:233–235. Saini JS, Jain AK, Sukhija J, et al. Anterior and posterior capsulorhexis in pediatric cataract surgery with or without trypan blue dye: randomized prospective clinical study. J Cataract Refract Surg. 2003;29(9):1733–1737. Wong VW, Lai TY, Lee GK, et al. A prospective study on trypan blue capsule staining under air vs under viscoelastic. Eye. 2006;20(7):820–825.